Rare custom home lots--South Mountain area--views of central Phoenix! Rarely does one find quiet, rural, improved, custom home lots nestled in the heart of a city. 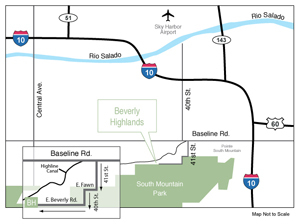 Beverly Highlands, with only six lots, has achieved the virtually impossible. With mature native desert landscaping, and spectacular mountain and city views, the lots are close to South Mountain Preserve, and close to major transportation corridors in central Phoenix. For anyone regularly traveling in and out of Sky Harbor Airport, this is the place to live. Major shopping (Arizona Mills and Legacy Village) are each less than four miles away, and downtown Phoenix is less than ten miles away. No more driving from around the mountain or other outlying areas to reach the action!